Sustainable development is a highly topical issue and is of critical importance to tourism as the environment is of utmost importance for the continued development and prosperity of the industry. There have been numerous texts written on sustainable tourism and the measures to mitigate and manage this but none which acknowledges Information and Communication Technologies (ICT) as a mechanism of doing so despite being an emerging area of research. ICT in this context refers to innovative tools which form an integrated system of software and networked equipment that facilitates data processing information sharing communication and the ability to search and select from an existing range of products and services for an organisation's benefits. Despite the symbiotic relationship, which exists between ICT and sustainable tourism, there has been little research, which has considered how the use of such technology can be used to make sustainable tourism development a more workable reality. This opportune book is the first to provide a focus on the interrelationship of these two important topics demonstrating their synergies and providing insight into a new and innovative approach to managing sustainable tourism development. It considers the use of technology to reduce the negative impacts of tourism from both the demand and supply side perspectives. A critical review of a range of cutting edge technologies used by tourists and businesses to assess their usefulness in managing sustainable tourism development from the macro to the micro level is also discussed. 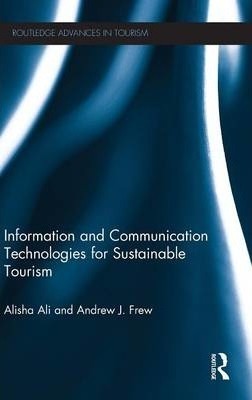 It further integrates examples and practical applications to show how ICT can be an invaluable mechanism in the management of sustainable tourism development. This cutting-edge volume provides a wealth of information on an important yet neglected subject. This book will be invaluable reading for students, researchers, academics and members of the tourism industry looking for new and innovate ways of fostering a more sustainable tourism industry. Alisha Ali is a Senior Lecturer in Hospitality Business Management at Sheffield Hallam University UK. Andrew J. Frew is a Research Professor in the School of Arts Social Sciences and Management at Queen Margaret University UK.